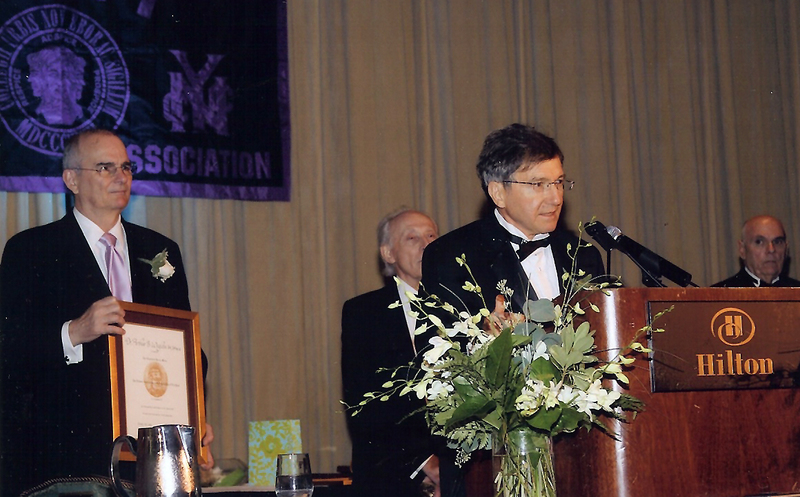 Arthur B. Weglein, Hugh Roy and Lillie Cranz Cullen Distinguished Professor of Physics, was one of eight 2008 recipients of the medal given by the CCNY Alumni Association. His award was presented at the association's annual dinner in October. Nobel laureates who have received the honor are Arno Penzias, Leon Lederman, Robert Hofstadter, and Herbert Hauptman, physics; Kenneth Arrow, economics; and Arthur Kornberger and Julius Alexrod, medicine. Previous awardees also include former Secretary of State Colin Powell; polio vaccine developer Dr. Jonas Salk; U.S. Supreme Court Justice Felix Frankfurter; composer Ira Gershwin; presidential advisor Bernard Baruch; former National Academy of Sciences President Frank Press; former Intel CEO Andrew Grove; mathematician Jesse Douglas; physicists Herman Feshbach, Joseph Birman and Benjamin Bederson; philosophers Ernest Nagel and Morris Raphael Cohen; political scientist Abraham Foxman; and writers Irving Howe, Lewis Mumford and Paddy Chayefsky. The CCNY class of 1906 established the award, which is given for outstanding postgraduate achievement, said Donald Jordan, CCNY Alumni Association executive vice president. A committee of former awardees considered 100 nominees this year. Former CCNY Provost, Dean of Science and Physics Chair Harry Lustig, a leading theoretical nuclear physicist, Mossbauer effect pioneer and former medal recipient, nominated Weglein, who earned three degrees from CCNY, including a Ph.D. in physics in 1975. "It was an amazing urban university—no dorms, no football team, no endowment funds—but with professors and administrators with a very deep understanding, commitment and visceral sense of the academic enterprise, and instilling integrity and credibility and never losing sight of the core responsibility of an institution of higher learning—educating students," Weglein said. "More Nobel laureates had earned undergraduate degrees from CCNY than at any other public university in the world." "This honor reflects upon my good fortune to have benefited from an education at CCNY and subsequently having worked with many outstanding researchers, colleagues and students," he said. After 22 years in the petroleum industry, Weglein joined UH in 2000 and directs the Mission-Oriented Seismic Research Program (M-OSRP), a consortium of the world's largest oil and gas companies. M-OSRP identifies and addresses pressing seismic exploration challenges whose solutions will have the biggest positive impact on our ability to locate and produce hydrocarbons. In 2004, the U.S. House of Representatives Commerce and Energy Committee invited Weglein to testify as an expert witness about the challenges in exploration and production of energy sources in ultra-deep water and whether directed fundamental high-impact research could address those challenges. The annual award is named for the founder of CCNY, the world’s first municipal free public institution of higher education. Harris was a successful New York City businessman, and his dream and vision was to provide free higher education for qualified working class New Yorkers without consideration of race, creed or class. Until that time, the inability to pay for a college education often precluded the city's working class from reaching for the American dream. Weglein draws a parallel between Harris' vision for CCNY and the Cullen family mandate in establishing the University of Houston to provide educational opportunity for Houston's working men and women. "I’m humbled and deeply honored by receiving the Townsend Harris Medal and enormously grateful and privileged to hold the Cullen Distinguished Chair in Physics at UH," he said. "We can never forget the contribution that great visionaries and patriots like Harris and the Cullens bring to us individually, to our communities and to our great nation."